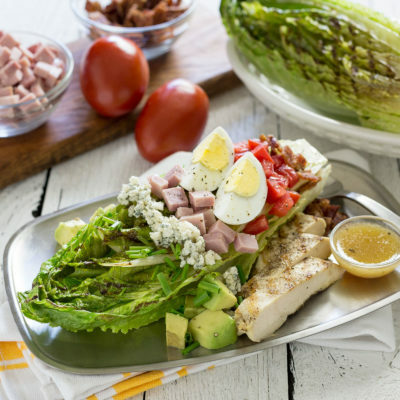 Bring out the sweetness of romaine hearts with a quick stint on the grill. Make the dressing by adding the canola oil, olive oil, vinegar, lemon juice, mustard, Worcestershire, sugar, and garlic to a blender. Blitz until smooth. Season with salt and pepper to taste. Set aside. Prepare all of the toppings for the salad in advance and set aside. Heat grill or grill pan with medium high heat until hot. cut the romaine hearts in half lengthwise and brush the cut sides with olive oil. Place the romaine hearts on the grill or grill pan, cut side down. Watching carefully, cook for 2-3 minutes or until you have golden brown grill marks. Do not char the lettuce. Place one romaine heart on each plate and top each with a quarter of each of the toppings. Drizzle with dressing or serve the dressing on the side.